The Intercultural Variety Concert will be held on Saturday, 16th March at the Wendouree Centre for Performing Arts as a highlight of Ballarat’s Harmony Fest during Cultural Diversity Week. Many of Ballarat’s finest performers have donated their time for this worthy cause. The spectacular Chinese Lion Dancers, the colourful Thai and Bollywood Fusion Dancers; jazz, soul and operetta singers, including Prudence Hare and Christine Heald, Susan Jackson, Enduring Classics and Daylesford Soul Choir; cabaret star Maureen Andrew pays tribute to Liza Minnelli; the Ballarat Grammar Pipe Band with highland dancing; a jazz piano duet; a classical ballerina, and the Little Brass Band. The Hon Catherine King MP, Federal member for Ballarat will open the concert. Not to be missed. The concert is BRMC’s first musical event following the launch of a fundraising campaign for purchase of a grand piano for the Ballarat Welcome Centre. 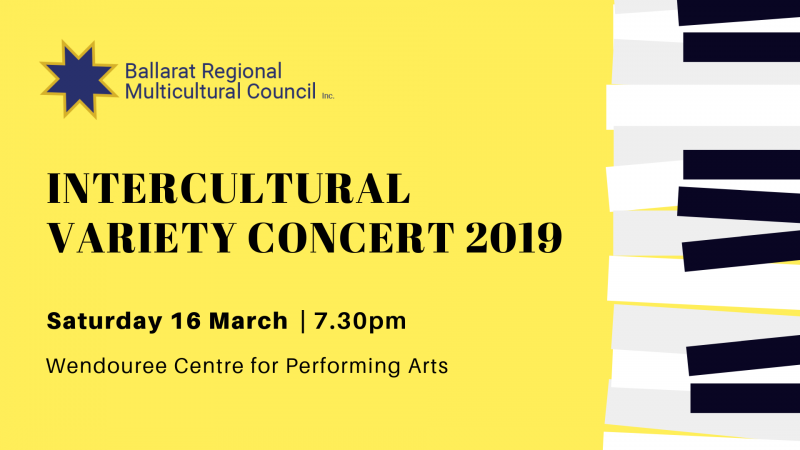 BRMC supports and hosts many cultural and intercultural events around Ballarat and is aware of the need for a small performance and exhibition venue for intercultural performance and chamber music. Proceeds from the evening will contribute to raising funds for a piano to support future musical talent in our culturally diverse city. You can be part of this effort as the fundraising continues until the piano can be purchased. Anybody can purchase a piano key for $250 and a pianometer will measure donations made. Or team up with a group of people to purchase a single piano key. All contributors may choose a piano key and will be acknowledged by name on the pianometer that will be displayed in the concert venue. Book now for this fun-filled night of entertainment for the whole family.